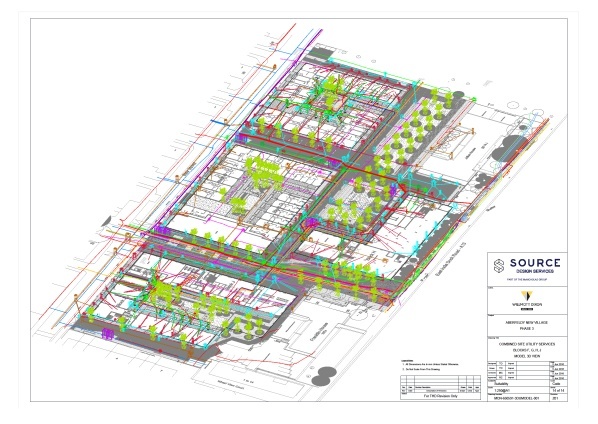 We were given the remit to produce 3D models of all existing utilities within the site boundary of Aberfeldy Estate. On completion of this model, we were then to design a new 3D model encompassing every utility that would be needed for use in the proposed new development. With the proposed 3D design overlaid on to the existing 3D model layout, we could then analyse and rectify any clash possibilities using the analytical properties of our software on the joint model. We can also create an underground model solution that is dynamically efficient for any on-going or future design change. 3D site survey to determine site wide ground layout and position of utility manhole covers within the site boundary. Lift and look survey to determine existing number of ducts at each individual manhole. Creation of site wide surface model with AutoCAD Civil 3D. 3D Model production of existing utilities underground model. Production of surface model for client’s site layout ground level footprint. 3D Model production and client design correction of proposed utilities layout. Model integration of existing and proposed utilities layout. Analysis of model, clash detection and design correction at clash points.